While the official version of the story behind this seven song set has a seven-inch reel to reel tape found in the archives of critic and Rolling Stone co-founder Ralph Gleason, this sounds remarkably similar to things I heard back in the beginnings of the bootleg era. A bit crisper, given the probability that it was a first generation copy taped straight off the mixing desk but definitely familiar. 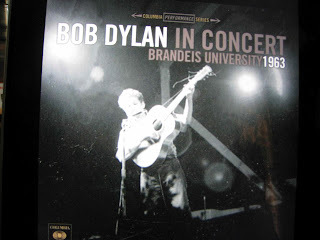 Once it had been unearthed, the contents initially appeared through Amazon.com as a bonus disk for customers who bought The Bootleg Series Vol. 9 The Witmark Demos: 1962-1964 or The Original Mono Recordings and subsequent demand saw a wider release, with the hard copy version coming with liner notes by Dylan scholar Michael Gray, author of The Bob Dylan Encyclopedia and the three-volume Song & Dance Man: The Art of Bob Dylan. Not that you're going to get such fripperies with the digital download, you understand. 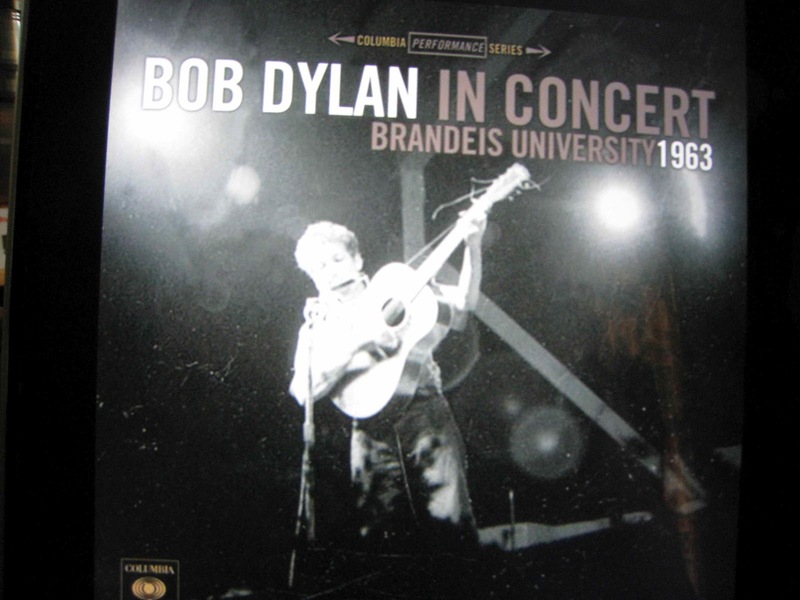 As far as the actual contents are concerned, we're looking at two sets from a Brandeis University folk music festival on 10 May 1963, featuring Bob Dylan, one of the new and most exciting blues performers; Jean Redpath, foremost singer of Scottish ballads, Don Stover and the Lilly Brothers from West Virginia and Boston's Hillbilly Ranch; Jesse Fuller ... and the silver leaf Gospel Singers. Honey, Just Allow Me One More Chance (Incomplete), Talkin' John Birch Paranoid Blues, Ballad of Hollis Brown and Masters of War seem to have come immediately before an intermission, and while there's no way of knowing if Talkin' World War III Blues, Bob Dylan's Dream and Talking Bear Mountain Picnic Massacre Blues followed the resumption what’s obvious a matter of days before the release of The Freewheelin’ Bob Dylan is that Dylan was already a skilful performer firing on all cylinders. Given the MC's remarks at the end it's even possible Dylan was, in effect, the headliner. Not, perhaps, an essential purchase but it’s a timely reminder of how good the early acoustic Dylan was, and a pointer indicating a need to grab Live at the Gaslight 1962 and Live at Carnegie Hall 1963.